Herpes viruses infect most animal species, and horses have their own special brands--EHV type 1 and EHV type 4. Equine herpesvirus, also known as rhinopneumonitis, is responsible for a range of equine illnesses, from respiratory and neurologic ailments to abortion. The virus is transmitted primarily through the respiratory system (inhalation). It is relatively delicate and will not survive in the open environment for very long. Following an incubation period of about a week, the virus manifests itself in several ways. Early clinical signs include fever (as high as 105 degrees F), depression and loss of appetite, followed by a clear mucous discharge which may become purulent or 'cloudy' over time. Swollen lymph nodes and coughing may be present, but are not a consistent clinical sign. Influenza, the other primary respiratory virus in horses, is a more serious problem than herpesvirus. The respiratory form of herpes generally occurs in youngsters--foals, weanlings and yearlings. If the animals are properly cared for, infections will run a natural course of a week or so followed by resolution; complications are fairly uncommon. Both EHV-1 and EHV-4 cause the respiratory form, and clinical signs are indistinguishable between the two different sub-types. Immunity is short-lived, and most horses are re-infected during their careers. Re-infection is generally mild except in the case of brood mares. The most significant side effect of the respiratory version of herpesvirus is secondary bacterial pneumonia. Any respiratory virus compromises the horse's immune system and defense mechanisms, thereby predisposing it to bacterial pneumonia. It also appears very likely that once a horse has been infected with either EHV-1 or -4, it will persist within the horse without clinical signs until there is a period of stress or immunosuppression. Once the latent virus is 'reactivated,' it will be shed into the environment, and clinical signs will again become apparent. Preventative programs, including vaccination, have no effect on latent infections. While respiratory disease is the most common, there are other problems associated with herpesvirus EHV-1, which can cause abortions and neurologic disease. The neurologic form of herpes is uncommon. However, if your horse should contract it, signs to look for include fever, weakness and stumbling, and urinary incontinence. 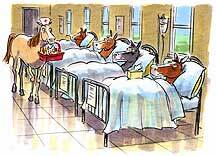 Generally, multiple horses on a farm will be affected, and some may die. In addition, pregnant mares infected with EHV-1 in the last trimester may abort or bear weak foals that will die shortly after birth. Currently, vaccinations are the only control measure available. Several manufacturers produce both EHV-1 and EHV-4 vaccines, often in a vaccine "cocktail" that includes influenza. While these vaccines will afford some protection and immunity, they will not prevent herpesvirus infection, only lessen its severity. Effective disease control always depends on a combination of vaccination and good management. If a horse is suspected of or diagnosed with herpesvirus infection, management includes good nursing care, reduction of stress, including cessation of training or work and minimizing potential complications such as bacterial pneumonia. Viruses are not sensitive to anti-biotics, although some veterinarians administer them to prevent secondary complications. Antibiotics should never be initiated without consulting with a veterinarian. Mark Crisman, D.V.M., is with the Virginia - Maryland Regional College of Veterinary Medicine. keeping horses in smaller groups and, where possible, moderating or minimizing stress factors. Read the next horse diseases article on Ring Bone - Osteoarthritis of coffin joint.